SUNSET BEACH, NC – The Myrtle Beach area has an abundant selection of golf courses befitting any player’s game and interest. However, Thistle Golf Club is special. Whether a player is steeped in the history and tradition of golf, or simply enjoys playing a truly quality course, Thistle Golf Club pleases all. 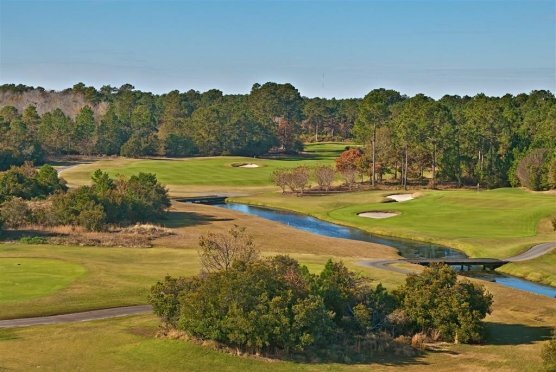 Located just 20-minutes from North Myrtle Beach, the club is a tribute to the original Thistle Golf Club. During the 1800s they shared with other clubs the Links of Leith in Edinburgh, Scotland, considered the birthplace of golf. The Rules of the Thistle Golf Club, published in 1824, reported rules and conduct that have influenced today’s game. That commitment continues in the present club’s philosophy of excellence, pride and tradition. Excellence is displayed in the outstanding design and conditioning of the course as recognized by theGolf Digest 4 ½ Star Rating. The Thistle Club staff embodies a certain pride in their club. The tradition shines with the preservation of the history and heritage from their Scottish namesake. The course itself is one you’ll want to visit again and again. Each of the three 9-hole layouts is challenging with no two holes appearing to be the same. Architect Tim Cate and Superintendent John T. Pridgen have done a marvelous job in design and conditioning. We had the pleasure of playing the Cameron to Stewart course, Par 71. Pay attention to the Tee/Handicap recommendation on the back of your scorecard. On a cool January day with very quick greens the Blues were probably a little more than I could handle. With a short game that wasn’t particularly good that day, I struggled. Tee to green the course is magnificent and in great shape. More than just eye candy though; this venue is one that is enjoyable to play. Here are just a few tips. The hazards do come into play, which ever tee you play. There are forced carries over water and marsh, but should not be an issue from the proper tees. The greens are large with considerable undulation and speed. One of my playing partners felt the Par 3s were fantastic. There are 5 of them ranging from 156-yards to 193-yards from the Blues and 134-yards to 177-yards from the Whites. Your finishing hole on Stewart is the most memorable and challenging. Your tee shot needs to carry a large water hazard to an uphill green well protected by sand bunkers. A bailout area to the left offers some relief, but there’s nothing good to the right. The Par 4s each display their own character, but have one thing in common. It’s necessary to get off the tees with accuracy. Pay close attention to each hole’s layout and calculate your distance allowing for even slight elevation changes. No. 2 on Cameron with its #2 handicap is particularly challenging. Water down the right from tee to green swings in front and to within 10-yards of the green. A front pin position can be a real challenge. Even if a poor drive demands a lay-up, make sure of your yardage and allow for their ever so slight downhill drift. If you expect to score well, take advantage of the straightforward Par 4s. The Par 5s are not particularly long, but each has its own interesting character. No. 5 on the Cameron is just 475-yards long, but well deserving of its #3 Handicap. It has everything you want in a golf hole. It’s a real photo opportunity with a waste bunker to the left and a sand hazard to the right and a drive over water to a narrow fairway. Did I mention the tree in the center of the fairway about 100-yards from center green? The course is particularly ladies friendly and is an experience that all serious junior golfers should have. The pro shop is well stocked with logo merchandise and the snack bar at the turn offers all your favorite fare. At the risk of oversimplification, I’ll return to the Thistle Golf Club soon and often.